The Snohomish County Arts Commission today announced a new art exhibit by Snohomish County artist, Jackie Cort, that is on display through May 25, 2018 in the lobby of the Robert J. Drewel Building (3000 Rockefeller Ave, Everett, WA 98201). 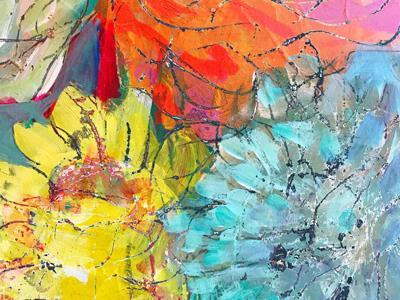 Cort adds vivid color to molten beeswax in her encaustic works. She uses brushes to spread the buttery paste of the color and wax onto wood or canvas surfaces. She carves into the wax and adds heat from a blow torch. As the wax melts, she melds the colors further with a rub of her palm infusing emotion into every piece. Cort became a full-time artist in 2010 after raising two children and working various day jobs. She also teaches classes at the home she shares with her husband in the Machias area and does numerous workshops for Schack in Everett. The Robert J. Drewel Building is located in downtown Everett at 3000 Rockefeller and Wall. The exhibit is free and open to the public during regular business hours.